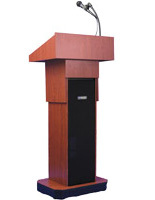 Addressing a large crowd requires two pieces of equipment: a podium and a sound system. Why purchase them separately? 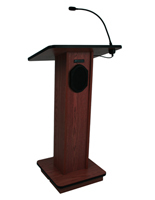 A lectern with microphone is an all-encompassing solution for speeches, lectures, award ceremonies and more! 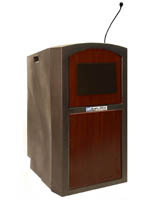 An electronic lectern gives the speaker a fixture to stand behind, a platform to hold papers, and acts as a landmark that directs the focus of the audience towards the center of the stage. 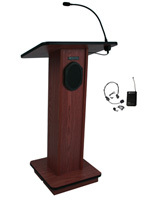 Integration with audio equipment like a microphone, whether it's connected via cables or wirelessly, makes for a seamless piece of equipment that is beneficial to any event coordinator or building manager. 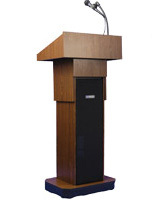 Purchase the microphone and lectern together, in the same unit, and ensure that everything is compatible, properly constructed, and has a professional appearance. 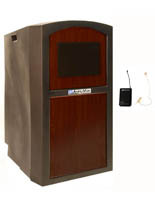 The microphones are typically handheld, with a lengthy cord, and secure to a stand that sits on the podium when not in use. 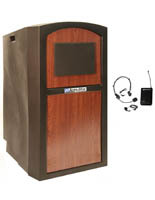 The signal is then carried down through to an amplifier and can be connected to an external PA system, or played through speakers on the podium itself. Please review each product for the exact specifications and features. 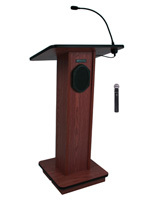 Some of these lecterns with microphones employ Bluetooth® technology for cordless presentations that allow the speaker to move about the stage or even down to the audience. 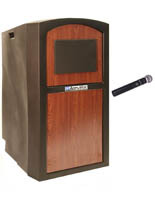 Use the control panel on the lectern to adjust the control settings, so the microphone is at the right volume, and doesn't have too much bass or treble. 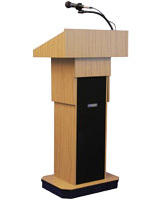 When choosing a lectern with microphone, explore the different designs, styles and finishes available. 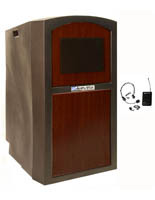 Do you want to go with a mahogany veneer? 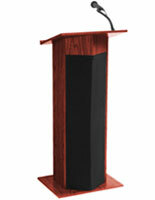 Perhaps a cherry, walnut or light oak finish would be the best complement for your stage and backdrop. If the lecture hall does not have a PA system, choose a lectern with built-in speakers that will project the sound to even the furthest reaches of your audience. 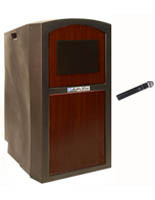 Some of these podiums are height adjustable, so a series of different sized speakers have no trouble reaching the microphone and delivering their discourse to the theater or auditorium. Will the podium need to be transported outside? If so, choose one with a weatherproof plastic shell. These work great for outdoor banquets, summer weddings, company picnics, and any other outside event! 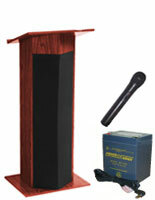 The microphone's rechargeable battery ensures that the mic is ready to go for the next presentation. The designs range from simple to sophisticated. 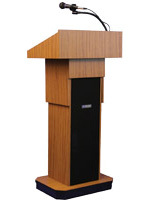 For the college lecture hall a basic lectern with microphone should be adequate, but for an auditorium where award ceremonies are being conducted, it may be wise to purchase a more robust model. Choose one with rolling casters on the bottom for effortless movement about the stage. 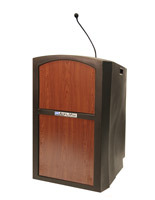 Check out each of these lecterns, and be confident that whichever one you choose will help make your presentation engaging, impactful, and most importantly at a volume that is audible to the entire crowd!